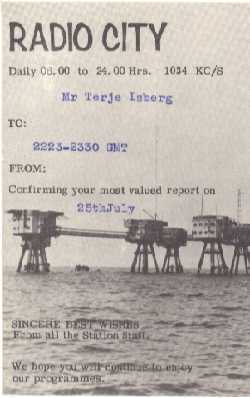 QSL Cards from Offshore Pirate Stations during the 60's. Plus some other interesting signals from Space. 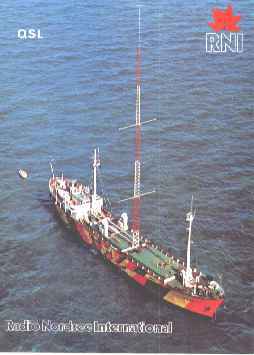 RADIO CAROLINE N. / S.
The list below is a collection of Pirate Radio QSL cards that I have received during the years from offshore stations. 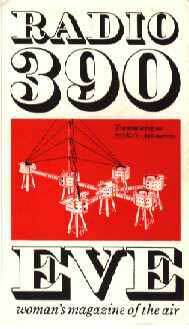 I was an offshore fanatic at the time and spent lots of time searching the MW band for new stations. 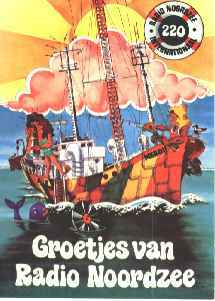 I even tried to get a job as technician with Radio Caroline, but my dream was never realised. Maybe as well, as I rarely cope with rough seas! 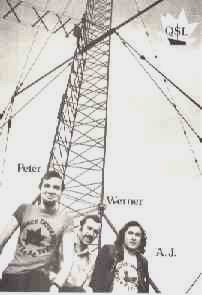 However, as a jingle creator I managed to get my somewhat primitive jingles played on a couple of offshore stations! 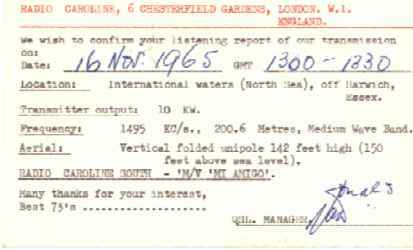 The data listed with each QSL card is the actual date, time and SINPO for the reception report. Two of the cards I had to create myself and send on to the stations and was lucky enough to get them verified and sent back to me. 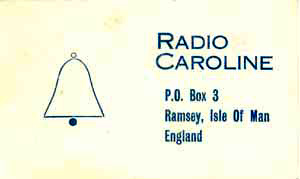 One of these exclusive cards is from Radio Nordzee and the other is an early Radio Caroline card. All clips are my own off the air recordings at home just north of Stockholm, Sweden. 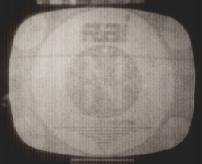 Only the 1974 RNI clip, was taped in Sachseln, central Switzerland where I lived from 1972 until 1978. 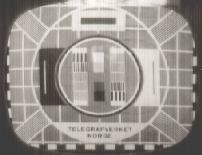 The transmissions were all, except for the 1974 RNI clip, received on a TRIO 9R-59 and recorded on a Tandberg Model B43. The RNI clip was probably received on a Yaesu FR 101. 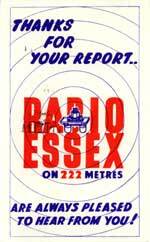 The aerial was a originally a dipole for 40 m, but for most of the Radio London recordings I used a home made 1 meter square selective frame antenna to avoid interference. This antenna was so directive that I could phase out the local 150 kW Stockholm on 773 kHz, located some 20 km from my QTH, and receive Radio 390 on the same frequency! In Switzerland I used a 15 meter long wire in the attic of our apartment building. 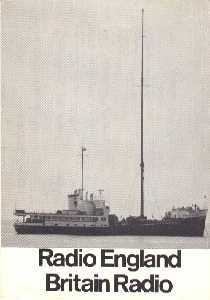 Radio Caroline from 11th Aug. 1964 on 1520 kHz, 197.5 m. Two audio clips from the very beginning of July 1964, when she was steaming north from Harwich to Ramsey, off Isle of Man to become Caroline North. 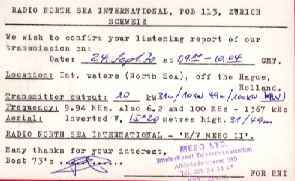 Radio Scotland from 8th January 1966 on (1241 kHz, my record) 1236.5 kHz, 242 m. According to the broadcast were they at that time anchored 4 miles off Dunbar, Scotland. The transmitter was an Ampliphase 10-20 kW with a half-wave inverted V dipole arial. on 1495 kHz, 199 m.
on 1520 kHz, 199 m.
on 1169 kHz, 256 m and 1187 kHz, 253 m.
on 1349 kHz, 222 m.
9940 kHz, 31 meter band. 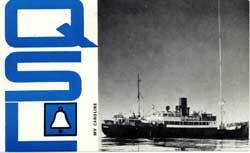 Very special, one off QSL! It is from the close-down of the 31 m service on that day 1003 GMT. 6204 kHz in the 49 meter band. This was the official start of the 49 m band service. 6205 kHz in the 49 meter band. 6205 kHz, 49 mb. Location given as 52N 10' 2'', 4E 12' 4''. From yet another close-down of RNI. 602 kHz in the MW band. 6060 kHz in the 49 m band. I monitored the transmission on 8th March 2011 from the start in the morning until late at night the same day. 88.3 / 89.6 MHz on FM. I heard Radio Syd a couple of times when travelling through Helsingborg in southern Sweden. Once I stayed overnight in a hotel i central Helsingborg and I hooked up a piece of wire to the Philips Philetta and could listen almost without noise. In the car I used a home made FM radio with a pulse-counting detector. This receiver was not the most sensitive construction I've seen, but it could be used to hear Radio Syd travelling south from Helsingborg along the west coast of Sweden. Radio 270 could be heard frequently at my location in Stockholm, but its signal was mostly full of interference. 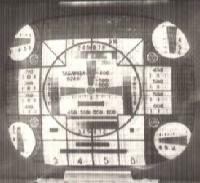 A weak signal from USSR could often be seen in the summertime from across the Baltic Sea on Channel 2. This photo was taken on th 8th of June 1962. A weak signal from Italy in the summertime by sporadic E on Channel 2. 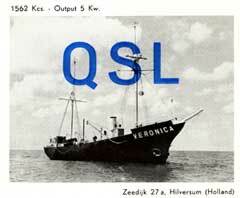 A steady signal from Norway on CH 7 in Band II on 31st October 1964. This reception is a bit of a mystery, as the signal was steady over a fairly long period that day. The first Chinese satellite playing a Chinese chart topper! Heard on short wave near 20.0 MHz for a few weeks in the beginning of May 1970, until it went more and more weird and finally died. This recording is from 9th May 1970 in the afternoon. © T. Isberg. All sounds, images and content of this page is the sole property of Terje Isberg and may not be reproduced in whole or in part without a written permission.